You know that I am a mom of nothing but boys right? 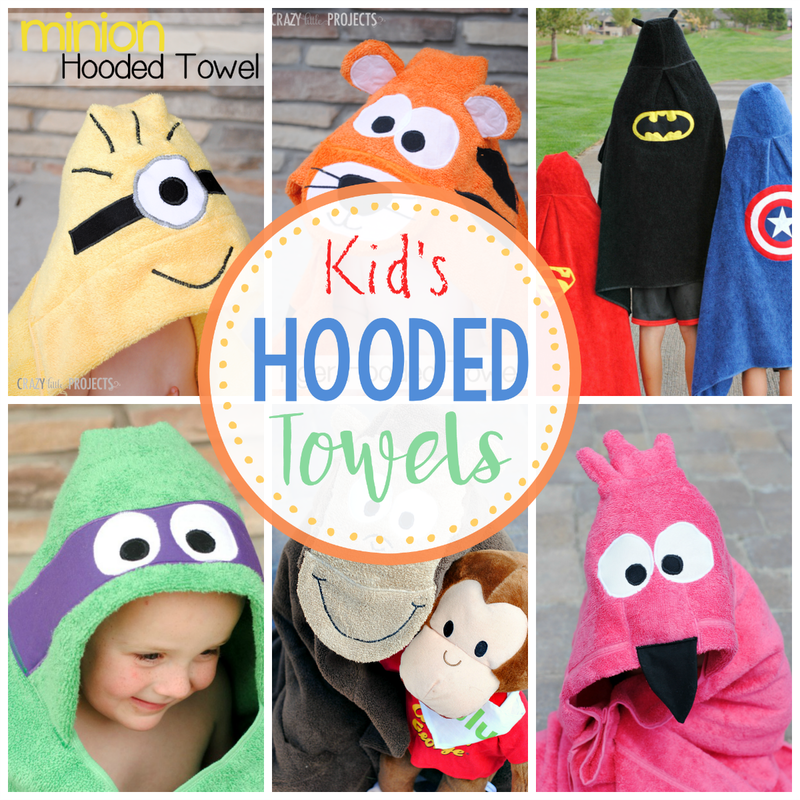 Sometimes it can be hard to think of fun things to sew for those little people! 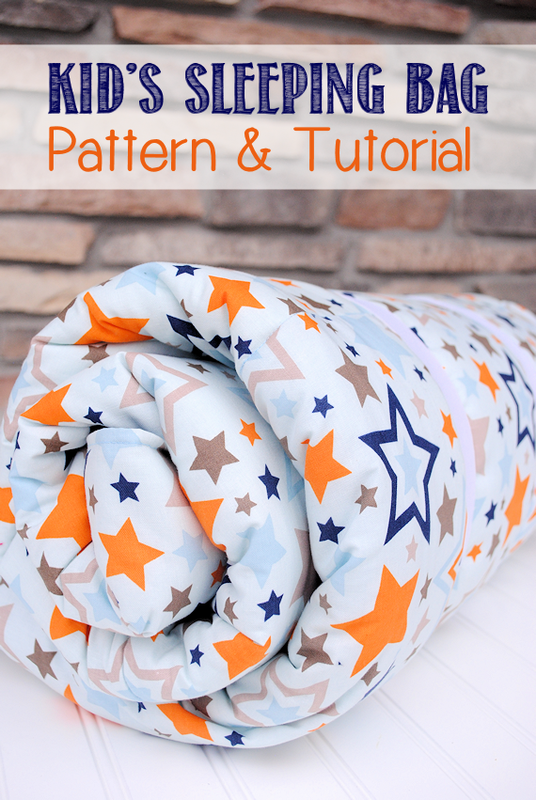 We were camping one weekend this past month and the idea to make a kids sleeping bag pattern for you all struck me! I don’t know if this is warm enough to camp with, but for sleepovers it will be perfect. (Oh, and of course it’s great for girls too!) I’ve got to tell you, this is one of my favorite projects I’ve ever made. I love how it turned out! You know what I think would be a really sweet idea with these? Grandma could make one for each of her grandkids for when they come to sleep over. Or really just make it anytime for anywhere. It’s fun! My 5-year-old LOVES it! 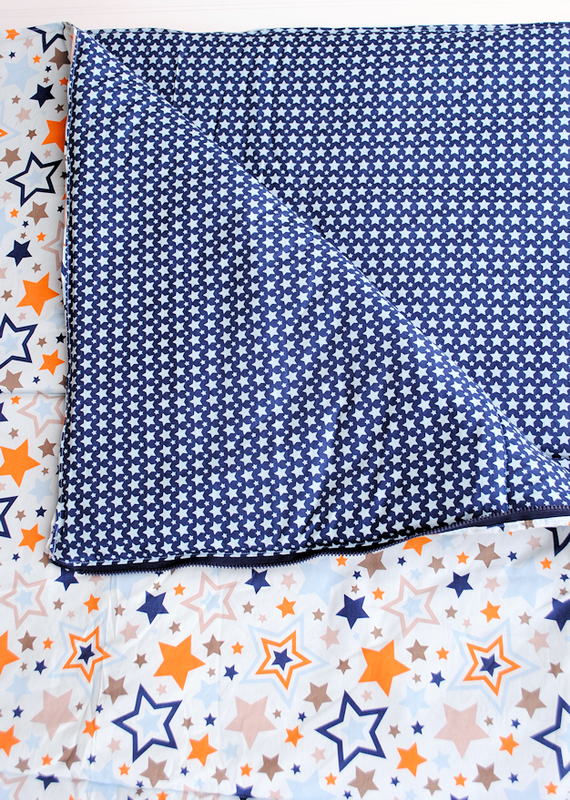 3 yards each of 2 coordinating fabrics (This will make a preschooler size sleeping bag. Get more if you want it to be longer.) OR-get 60 inch wide fabric if you can and just fold it in half to create the sleeping bag. If you do that you will need half as much fabric. I realize that this much fabric could be pricey, so watch for sales or use a coupon! Extra long zipper-most stores only sell up to 36″ zippers. That’s the size I used and it works fine. If you want a really long zipper that goes all the way down the sleeping bag you’re going to need to special order it on the internet (just search for extra long zippers). To make this bag you are going to cut your 2 fabrics in half so that they are each 1 1/2 yards long. I also trimmed off the edges of the fabric so that my sleeping bag is only 34 inches wide. My sleeping bag fits my 5 year old perfectly. 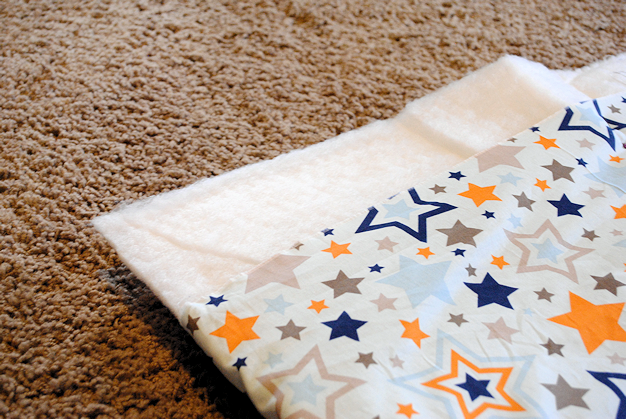 If you want it to fit an older kid you’ll want to cut the fabric a little longer. Sew straight down the edge catching both fabrics and the zipper in between. When you are trying to sew around the zipper pull, just move it out of your way. Now do the same thing on the other side of the zipper with the other 2 pieces of fabric. Now, with right sides of your OUTER fabric together, sew the rest of the way down fabric on the side that has the zipper. You’ll be sewing through ALL 4 layers of fabric here. Then sew it (again through all 4 layers) across the bottom and up the other side and turn everything right side out. You should have something that resembles a very flat sleeping bag at this point. Now place your batting on top of your bag and cut it to fit (you’ll probably want it to be an inch or so narrower than the bag. I cut 4 pieces because I wanted a double layer. Two pieces go in each size. If you don’t want it as thick you can do 1 piece in each side. Now, get down on the floor for this…you need to get that batting inside each half of the sleeping bag and this might take some wriggling around with your arms all the way in that sleeping bag. Make sure to get the corners of the batting all the way to the bottom corners of the bag. When you get them there, pin them in place. Then work on smoothing the batting out until it is laying as flat as you can get it. I just do one side of the sleeping bag at a time. Pin it in several places to keep it from moving around. Now, if you have a walking foot, this would be good time to use it. If you don’t, that’s ok. I didn’t. You might want to use a heavy duty needle if your machine struggles with this (I didn’t, mine was fine, it’s just a suggestions). Draw a couple of lines across your bag going horizontal to the bag. I did mine about 1/3 of the way from the bottom and 1/3 of the way from the top. Now sew along those lines to keep the batting in place. This is going to be tricky to maneuver all of that fabric through your machine. Be patient. You can do this. Do all of this to each side. At the top I had some excess batting hanging out. Trim that down so that it is about 1 inch SHORTER than your sleeping bag. And sew all the way around the top of the bag. And that’s it. You are done! How did it go? I used 1-inch wide elastic to make 2 loops to slip around this when it is rolled up. I cut them each about 18 inches long or so and then just sewed a straight stitch nice and securely on them and created loops. They slide on and off of the bag easily and make it easy to store. This is so cute! I am a grandmom of 10 so this would be pricey for me to make one for each. So I thought this would be a really cute birthday or Christmas present. Along with the sleeping bag I thought matching PJ’s For the boys camouflage and for the girl pink camo. (my granddaughters love pink camo) They would think it really funny that we could not “see” them in the sleeping bag! Thanks for this really, really cute idea. If anyone is needed a very long zipper I use WAWAK sewing supplies for item you can’t find at stores. Thank again for sharing this very cute idea! Oh I hope you do that! That sounds like SO much fun for a Christmas gift for the grandkids!!! Wouldnt buying zipper off the roll work for this? they are heavy duty metal zippers and you can purchase how long you want. I believe joannes has this in regular stock. I hate anything I have to special order I am a want it when I want it girl gee must get that from the kids lol. I definitely would. I just couldn’t find any when I was shopping, but you’re probably right-Joann’s probably has them! I made one 2 years ago – whipped it out on Christmas Eve. Though I initially did velcro and then replaced that with snaps. My boy loves it, even though he has since outgrown it. So many fun materials to choose from…. What an ambitious project! 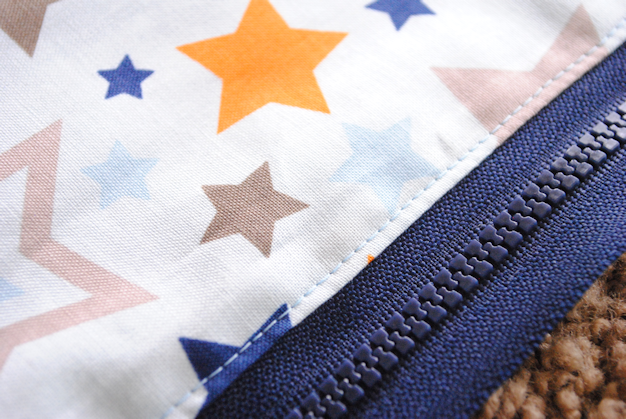 Kids would love having a sleeping bag especially if they got to choose their own special fabrics. This would be an awesome nap mat for preschool. I am going to try and make one for our daughter. Wonderful project! It would be easy to make matching bags for a little girl and her doll. Thank you for sharing your tutorial….so cute. What a great project! I can hardly wait to get started. I had an idea regarding the storage loops. Instead of making separate elastic loops, I’ll measure the rolled up bag and cut two 4″ wide strips of fabric that length. Then I’ll make a narrow hem at each short edge and fold the strips in half lengthwise, press, then fold each raw edge into the center, making a 1″ wide strip. I’ll stitch along the open edge of each strip and sew a short strip of Velcro on opposite sides of each end. Then I’ll fold the strips in half and attach them to the bottom of the sleeping bag. 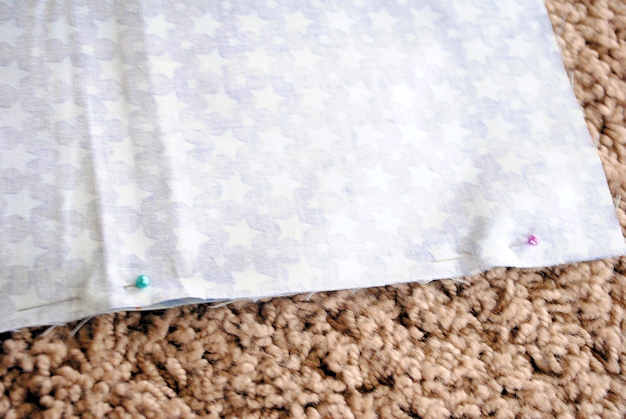 Roll the sleeping bag from the top down and secure with the Velcro strips. Voila! They’ll never get lost! 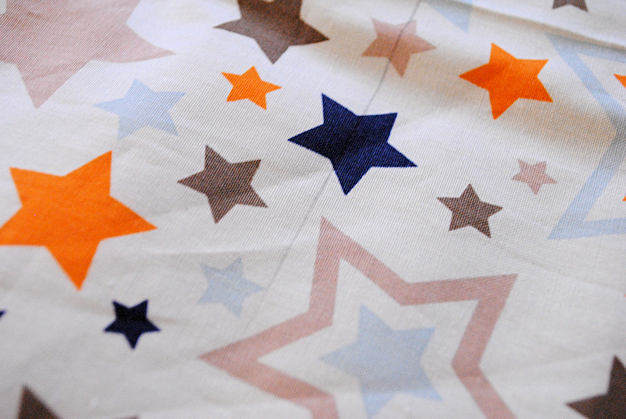 Where did you get your blue and orange star fabric from?I LOVE IT! I got it from http://www.theribbonretreat.com. I believe it is a Riley Blake brand of fabric. This is absolutely perfect! Thank you for sharing. This would be a fabulous little Christmas gift for my 3 year old girl! Thanks again! 2 year old girl and a 3 year old girl, for Christmas. My great-grand kids! You’re not too late! They aren’t too hard at all! try using the girl/ladies elastic headbands as the ties, they r more sturdy and last longer in all types of weather,and doesn’t bunch up or roll when washed. suggestion: use outdoor fabric like for porch couch cushions, it provides a durable bag for rugged boys and rowdy girls and its usually on sale this time of year. :) I am thinking of using the fabric called rib-stop that the military uses to match our military A-frame tent. Hi there, do you think you could recycle a duvet inner as the batting? How would that work? Has anyone else tried it? Have you got any other funky ideas for recycling duvet inners? Thanks heaps! I think that should work! Let me know how it goes. 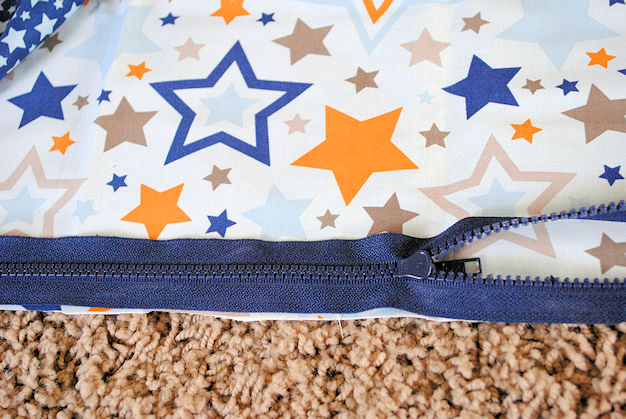 Does the zipper need to be like a coat zipper (comes apart at the bottom) for the child sleeping bag. The bag with the star pattern. Hmmm… there might be a future need for this. I need to do this! Next weeks project! Love the Summer Breeze and My Sunshine line! I need to make one of these for my daughter this summer. I don’t have a favorite fabric. By the way, do you know if there’s a way to add you on Instagram even though the program is not compatible with my phone? I love the Pepe in Paris fabric line! I love the Detour Destination fabric! Love the giraffe crossing! I don’t have instagram though! Bummer!! I actually used Le Creme basics to decorate my nursery! Same color, different patterns. I live in Texas with three girls and a big back yard. 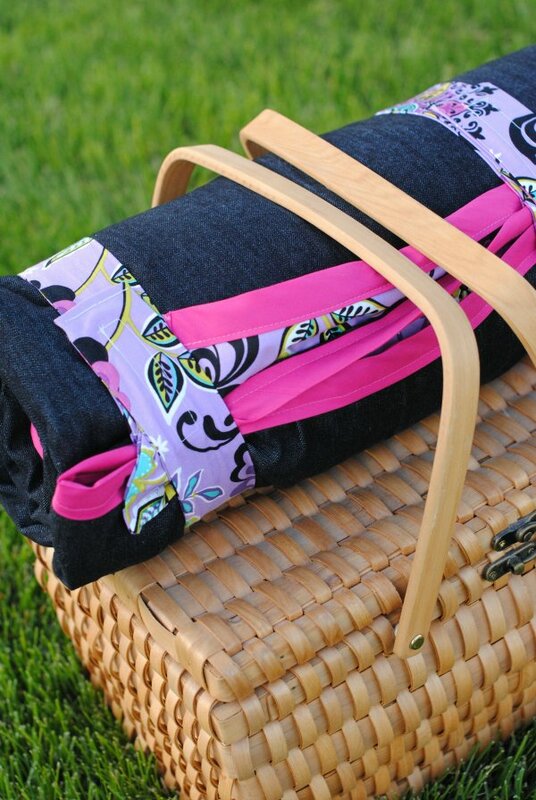 This will be perfect for a girls night camp-out! The perfect project for me to make for my youngest son! Giraffe crossing is so cute! 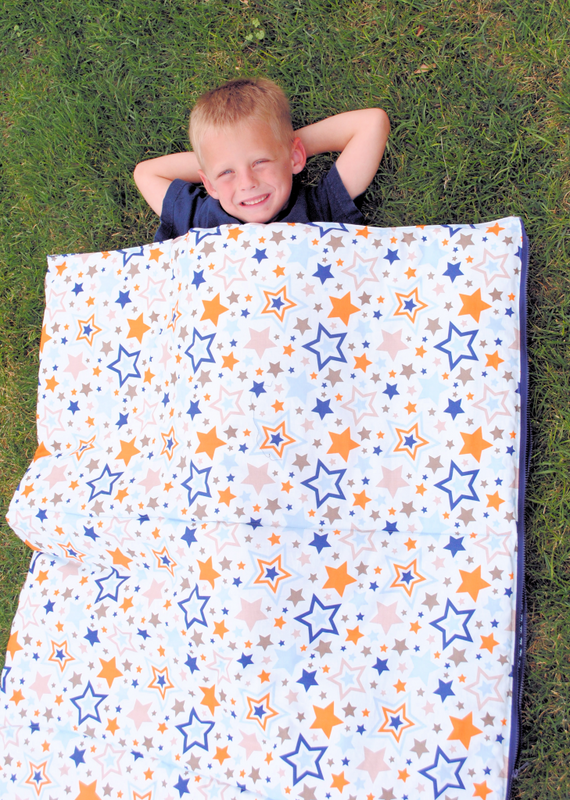 My son is in need of a new sleeping bag….this is just perfect! I love the Treasure Map collection!! I really want the Giraffe Crossing fabric..adorable!! Alamo my favorite that’s tough because I like almost all!!! One of my favorite designs!!! Stashed all over my fabric room! It’s impossible to pick a favorite, but I’m crushing on the adorable scenic route line. I’ve seen this project and it looks too cool to be real. gonna put it on my ever growing wish list! I had a hard time navigating through the site. It was super slow and it kept giving me an error message. What I did see, I really like the geekly (I can’t remember the name exactly), but it’s the pink mustaches! I want to see more! I like C2890 – Red Apple Of My Eye – Main, but it currently is out of stock! There are several other choices that I could easier pick out for different projects. I like the Andrea Flowers Fuschia fabric. There are too many to pick just one! I would like to use some of the one inch stripes to make a few maxi skirts. I would like one of these for me! I love her dots collection! Riley Blake: I have to choose just one???!!!!??? How about one Collection? Ok today my favorite is Pepe in Paris. Or the chevrons. Or maybe Vintage Verona. SEE??? I can’t choose just one! It’s not possible, I want them ALL! I love the new Giraffe Crossing! sunshine paisley green…but I like lots of them! i love this sleeping bag. I’m going to make them for my nieces for christmas in their favorite things! Im not sure I have a fav. fabric for Riley Blake- I love so many of their boys lines! Sleeping bag looks fun to make and what awesome colors. I really like A French Courtyard. I’m torn between the chevron print, the rocket and the pirate one! My 7 year old grandson might think he’s too old for this, but he might secretly love it if I use some cool space or batman fabric! I love the damask print! I absolutely love the treasure map collection….it is so difficult to find cute fabric like this for Lil’ Boys….so cute!!! love Geekly Chic cottons…any of them! Especially loving the cameras and sneaker prints. I like the Giraffe Crossing, so cute.. I like the Lost and Found 2 cotton fabric. I really like the honeycomb dot in Navy. I love One For The Boys, I have a thing about stars, they’re so pretty! I like all the chevron prints they carry. I’m pinning this for future grandbabies! Loving “One for the Boys” and “Snips and Snails”! I really like the Pop series from Riley Blake. Especially the red. Looks like such a fun fabric! lost & found is awesome! Maybe my new nephew would like one. I have some time to get this together with another zipper project he’s only 2 month’s old today! Union Jack squares grey is my favorite. I could make these cute little bags for my niece and nephew! Made it this far, hope that I win! Giraffe Crossing is just way tooooo cute. Giraffes rock! I love the twice as nice collection, but I also like the apple of my eye collection as well. If I had to pick just one it would be twice as nice. Any of the Little Red Riding hood. TOO cute. I love giraffe crossings. I wish I needed a baby quilt right now. I don’t think I could get away with making something for myself with this. The giraffe crossings! It’s so cute! Don’t have instagram. And totally love Geekly Chic. Saved me from girly quilt tedium. This is adorable. I’m waiting for the new Rosecliff Manor line to come out–black and white-classic. Could be my new favorite. I love all of Riley Blake designs, the Giraffe Crossing is really cute, but if I had to pick only one, I am still partial to the Chevrons!!! Geeky mustache! The white / black is my favorite combo. This project would be perfect for the Camp a Lot line. I might have to make one for my niece. I love spring basics and unforgettable cotton!!! My nieces would love these!!! I really like One for the Boys even though it doesn’t look like it’s all available. Love the stars! I absolutely adore Little Red Riding Hood! It is by far one of my favorites. Love the idea of sewing for Easter while eating eggs! It’s so hard to pick just one! But I do love the Simply Sweet! My favorite fabric is the giraffe crossings. Cutest ever! Love the Gracie numbers, all 3 colors! I can’t wait for grandkids to make these! I’m in love with the Hollywood Pattern! I like many of the Riley Blake patterns, but one of my favorites is the Unforgettable Damask Blue. I love the large chevron fabrics at Riley Blake. I need to make 3 of these for when the kids go to grandma’s house. I like Giraffe Crossing. It will make a great baby quilt for either a boy or girl. 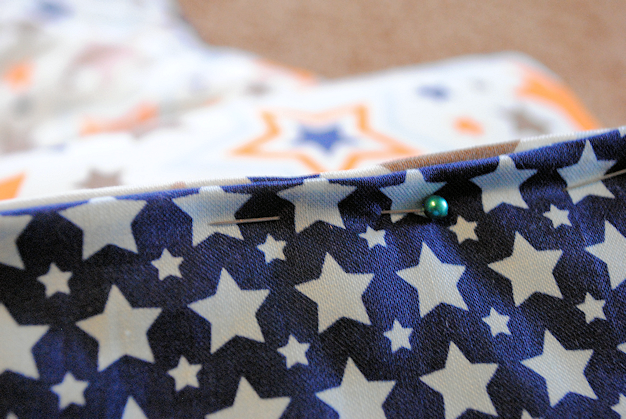 I’m using Vintage Verona right now for my star light star bright quilt along and just love it!!! This is cool. I wish I had some small kids to make it for. chevrons by far, any color! Rocket Age and Detour look fun and different! I like the Honeycomb patterns. Thanks for the pattern. Love the fabrics. I love the Summer Breeze line, especially the Summer Splash Blue fabric. I love the Scenic Route cottons! As a mom to two boys that love trucks, I could use this on all sorts of fun items for them. unforgetable is a must have for me. I’m IN LOVE with the Lovey Main White fabric in the Lovey Dovey collection. I got a fat quarter of it in a pack during January; I used it for my daughter’s Valentine’s Day skirt, and I was so sad when it ran out! It’s just adorable. I really would like the new treasure map panel for my son. Love Giraffe Crossing and Treasure Map!! Way too cute!! Right now “Enchant” is my favorite collection! Thanks Riley Blake+You for sharing! Gracie Girl Cottons! I think that I might just order some of each of them… So hard to choose. I fall in love with a new design each time I look at Riley Blake, so it is hard to pick but I just saw the treasure map panel and loved their cowboys prints! I love that they have such great boy prints! I love the treasure map fabrics! Perfect for a project for my grandson! I really love Detour and Unforgettable! I love the Andrea Flowers in fuchsia, so pretty. What is my favorite Riley Blake fabric?? One For The Boys (which, only solids are available anymore) and the chevrons; such awesome colors!!! I LOVE the Treasure Map Fabric! It’s so cute! My son would LOVE anything made with this fabric! A must try for sure! I love the Snug as a Bug. very cute and very cheery. I love Holiday & School Chevron & Dots, it would be perfect to make a maxi skirt with. Cotton knits! – and am looking forward to more organic cottons, too! What a great idea, my girls would like these! Cute sleeping bag. Pinned it just in case I have a little one in the future. So may Riley Blake patterns to choose from! I found myself drawn to the cotton summer breeze line. I tried my hardest to pick just one favorite, but the best I could do was narrow it down to two! Love the hooty hoot returns fabric which would be so cute for this project! This is a great project for all my friends children’s birthdays/ summer party sleepovers! I might have to make this one. Very nice. I’m in LOVE with the Treasure Map collection! I just love all the chevron. I know I’ll surely be sick of it one day, but not yet!! The giraffe crossing patterns! They are so cute! LOVE the Andrea Victoria cottons, especially the gray damask. Any of the Fuchsias, I mean. I gotta have that fabric!! So many great ones, but I like Andrea Flowers Fuschia! This would be a great gift for my little nieces! Thanks for having the scavenger hunt so i could see it. The hunt is fun, too. Giraffe crossing is so darn cute, would love to make some bibs with it. My favorite is the C3570-BLACK Mod Main Black I like how unique it is. My favorite is the C360-03 Girl Cotton Dots Medium Girl. I love polka dots! I love cottons, there are just endless possibilities. Since recently becoming an auntie for the 4th time in January I’m all about baby patterns. The Giraffe Crossing fabric is SO cute, and with all the colors it is perfect for clothing or toys. Wow, so adorable! I love the treasure map, unforgettable cottons, round up, country girls, rocket age, zombie Apocalypse Cottons is hilarious! I also like the giraffe crossing even though I’m not a huge fan of giraffes, but that pattern is adorable! I am going through the website and they are all really adorable!! I love the colors of Summer Breeze! what would you recommend for making a “real” camping out sleeping bag for a 2 year old? Probably use a heavy fabric-maybe denim or something? If I wanted to do a zipper so that the sleeping bag opened fully, what length would the zipper need to be? Just so I don’t order one too long or too short. Total up the length that you want plus the width. I’m in the process of making one for my son and I’m feeling stuck. I have attached the zipper, but just don’t understand the sewing right sides together, all 4 and on the zipper side. Can you help? I must do better with pictures and there isn’t one for this step. Ah I missed this till now. Did you figure it out? I have the same question as “Melissa” prior comment to mine? I will proceed as best I can, but am a little confused as to sewing all four together? I am thinking that somewhere I was supposed to cut 2 more pieces of fabric? I actually have one piece that is 58″ wide and one that is 22″ wide. just needing a little more clarification. You should have 4 total pieces of fabric. Two outer and two inner. I cut mine each 34 inches wide by a yard a half long. For those of you looking for a long zipper, JoAnn Fabrics has 100 inch Sleeping Bag zipper. They also have a zipper BTY (by the yard) available in the Home Dec area so you can get the zipper exactly the size you need. Made these this week for my two kids, as the fabric shop cut the fabric a bit short I added a pillow “mat” at the top to extend the length! Also, used very think wadding and it was so tricky to sew over! Yikes! I just finished making this for my son. My husband tested it and he loved it. Thank you for posting this. I have made two of these now. I love how easy they are to make. I have 2 granddaughters 4 months apart so made each of them their own sleeping bag for their birthdays, along with a pillow cover ( used leftover fabric) a movie and a book and some jammies. It is so much fun to make some personal for them. Thank you so much for these instructions, and what a clever idea! I have just finished making 2 of these sleeping bags for my twin boys for Christmas. I can’t wait to see their excited faces when they discover these sleeping bags under the tree, and am now wondering who else I can make a sleeping bag for?! Thanks very much! I’ve been sewing for years, and looking at your instructions I’m a little confused. If you use a 36″ zipper and you said to put it down from the top edge 2-3″, with the cut length to be about 54″ (1 1/2 yards), I have about 15″ left over on one side. So I’m assuming your zipper is not going along the side and on the bottom of the sleeping bag, is that correct? If you only sewed it down on one side, did you just sew the bottom shut? I didn’t see that in the directions or any photos showing the bottom of the bag. Maybe it’s because I’m thinking of a store bought sleeping bag where if it is unzipped and opened the bag it would lie flat like a comforter. I’m in the process of making one and I bought a 100″ sleeping bag zipper at Joann Fabric & Craft store. I’m making mine about 30″ x 63″ so my grandson will have room to grow. My thought is to sew the zipper down one side and the bottom. I thought of using fleece for the inside but knowing fleeces is stretchy and I’m using cotton on the outside I went with a nice blue flannel to go with the ‘Lightning McQeen (Disney Cars) blue cotton. I hope to hear back from you before I finish my project. Much thanks! I couldn’t find a longer zipper when I was making mine. If you have a longer one then by all means use it and adjust as needed! Thanks, I just didn’t know if I missed something in your directions. I have mine almost finised. I just need to top-stitch the lines across to keep the batting in place. I do love the star print on yours. Your fabric looks like it might be a little more like a light-weight canvas as I can see grains in it. I couldn’t find anything in the “Lightning McQueen” print that was heavier so I just went with the regular cotton. But I know my grandson will love it. Thanks for the idea… I would have never thought about trying to make a sleeping bag. Now I’m going to work on a carrying bag that will look like a backpack so he can carry on his back. Hi, I am in the middle of making this bag also as a birthday gift for my almost 5 yr old grandson. I am totally confused, which frustrates me because I have sewed for years. First of all, I am trying to finish below the zipper and can’t quite figure it out. Then, as I am trying to look ahead,, and you talk about sewing through all 4 layers, will there then be a raw seem on the inside of the bag? H E L P!!!! I had to go look at mine because it’s been a lounge time since I made it. Yes, there is a raw seam on the inside. You can finish that edge off with a zigzag or serger if needed. Thanks Amber. 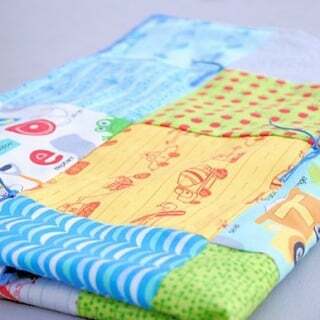 I am in the process of making a quilt for my grandson’s bed, but if he goes to a sleepover this quilt can be folded and zipped up to turn into a sleeping bag. I did this years ago for my girls but used a sheet and quilted material with a long separating zipper. This quilt I am making is from scraps I have had from clothes I have made for the grandson. So many thanks again in reminding me how to do it again. As I’m looking at this I wonder how the batting stays together after it’s laundered. 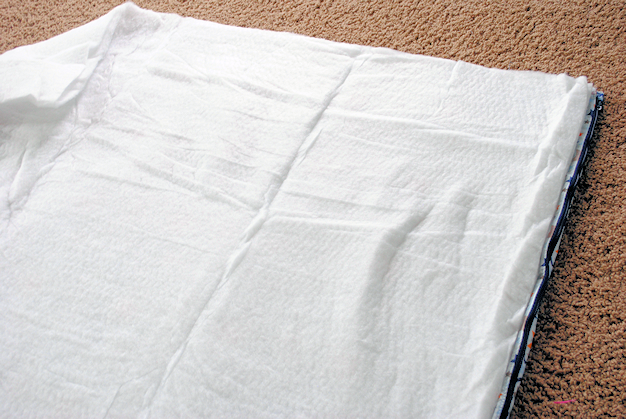 I have been quilting for many years and I’ve never seen a batting that will just lay there in place without some kind of quilting to secure it. I’m concerned on how much people are spending on materials and then if they go and wash it, it will bunch all up. There isn’t a batting on the market that lets you just lay it between two layers of fabric and expect for it to hold up. It looks great like this, but I’m just not sure this is actually feasible. For those that made these when this was first published, have you washed it? Curious as to how it held up and if so, what type of batting was used.